"But part of being a good debater is recognizing when you’re in a debate and when you’re just being a…"
"You don’t want to start setting up another rule book, like: “This is how you’re a feminist. And this…"
Thank you, everyone who has inquired. We are home from the hospital. I will bring her back tomorrow or Monday to see the renal specialist. If her numbers aren’t better they will admit her. She has a severe infection and one of her kidneys is failing. They hope as the infection gets better, her kidney might improve. She got really sick like this once almost 10 years ago, but she is so old, it is hard to know. They gave her some sedative and a mild painkiller but they don’t want to give her too much and stress her system. She isn’t in pain, I think, except when she tries to use the litter. Right now she is sitting on my lap and licking tears off my face, which she has done so many times. When I first brought her home, from the hardware store—they had found her in the parking lot, cut up and burned and hurt—she went under my bed and stayed there for months. She would come out at night to use the litter box and eat, but other than that I never saw her. Then one night she crept up next to my head and curled up, purring—I just lay as still as I could, hoping she would feel safe. She went back under the bed in the morning, and it took a long time for her to be as sassy and social as she is now, but since that first night she’s been in her same spot every night for the past 17 or so years. I’m just not ready to say goodbye. 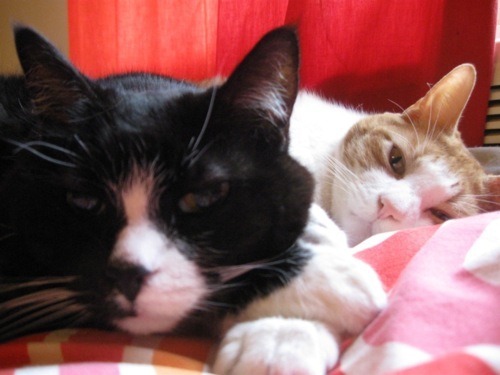 "Women who are fat are said to have ‘let themselves go.’ The very phrase connotes a loosening of…"
Today at the animal hospital with Monster, even through the panic and fear about what’s wrong with my little life companion of the past 18 years, I felt self-conscious about my weight. I thought other people in the emergency room probably were thinking that I’m lazy, and self indulgent, and a terrible pet owner, and of course she’s here by herself, who would love a person like that. It’s a mindfuck that is more paralyzing than any muscle spasm I’ve had, and it makes me feel like a double failure. I’m fat, and I’m not amazing/evolved/self-loving/fierce/feminist/whatever about it to be yelling “I LOVE MY CURVES” to the world. I know all the politics of it, but you just can’t undo it that easily, or I can’t. I get emails from my dad and all he talks about is his weight and the weight of everyone in my family. I haven’t seen him in many many years—even though I allow him to email now, since he got in touch when I was sick and I felt like, ok, to hear that your child is seriously seriously ill and not be able to reach her is not something I can impose in good conscience—but no way am I going to see him, because of all the weight I’ve gained in the past two years. I’ve dumped friends who made jokes about “fatties” at the gym on their facebook pages. (I probably would have done that anyway.) I’ve actively distanced myself from a few constant dieters—it was boring enough when I felt ok about my body, now it feels like an active rebuke. A friend’s kid yelled “YOU’RE FAT” to me a while back and I still cry when I think about it. I feel embarrassed to go outside, I want to apologize to people for having to look at me, I hate every single piece of clothing available to me at this size. On my birthday Jen and I were both wearing these bracelets that were part of her show a few years ago. I noticed hers was loose around her wrist but mine was snug. It’s like I can’t look at anything without it reinforcing what a total failure as an American woman I am. Horribly, selfishly, in what I consider to be a profound moral failing (more failing) on my part, although I want to embrace every kind of liberation, this is something I fear I cannot free myself from, it feels like, and it ensures an isolation I think will only increase. 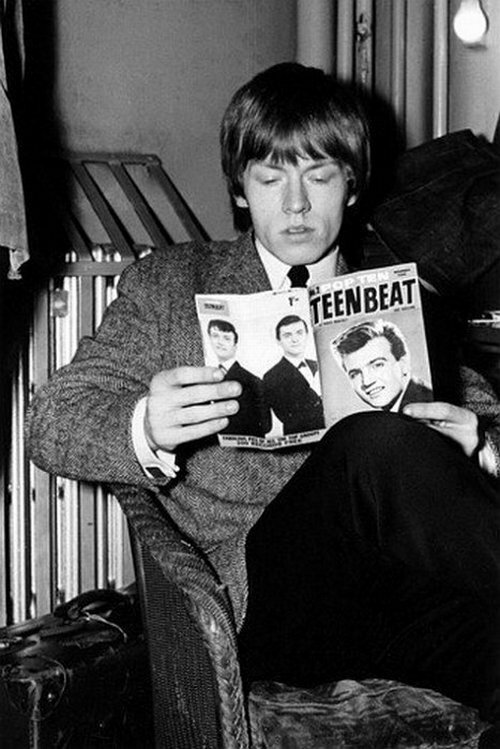 Brian Jones checks out the latest issue of Teen Beat, 1964. Following Charles Dickens on Twitter, which is the natural endpoint for every technology I encounter. If only Dorcas Lane had an account.